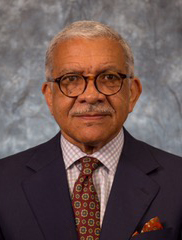 The Honorable William A. Webb, United States Magistrate Judge (Ret. ), is a Senior Advisor to the Shanahan Law Group, where he shares his unique insight and subject matter expertise in the areas of employment law, federal regulations, appeals and white collar criminal defense. Judge Webb helps shape and review the firm’s litigation strategy. He has extensive appellate experience and is certified as a federal mediator in all three federal districts in North Carolina and a certified North Carolina superior court mediator. Judge Webb is a Vietnam Veteran who was honorably discharged from the United States Air Force. He served as commissioner of the Federal Equal Opportunity Commission in Washington, D.C., where he worked with U.S. Supreme Court Justice Clarence Thomas. Judge Webb is married to Allyson Duncan, a federal judge on the United States Court of Appeals for the 4th Circuit. They have a son, Charles, who lives in Raleigh.